Jagram Revelatio IV Carport: The Jagram Revelatio Carport is a large, strong and high quality wooden car port. The carport has a generous 4 car capacity and can also be used for a range of other outdoor storage or shelter related purposes. The heavy-duty wooden posts hold up the Revelatio's sturdy wooden roof, and are additionally supported by attractive curved supports. The wooden carport is topped by bitumen felt roof shingles in either black, brown, green, or red, depending on your preference, which further protect the wooden roof of the carport. All wooden materials are pressure treated with an advanced formula preservative to guarantee the wood for ten years against weathering, decay, and insect attack. The carport is secured by cementing into the ground and can be given a paved or brick base (such as in the images above). 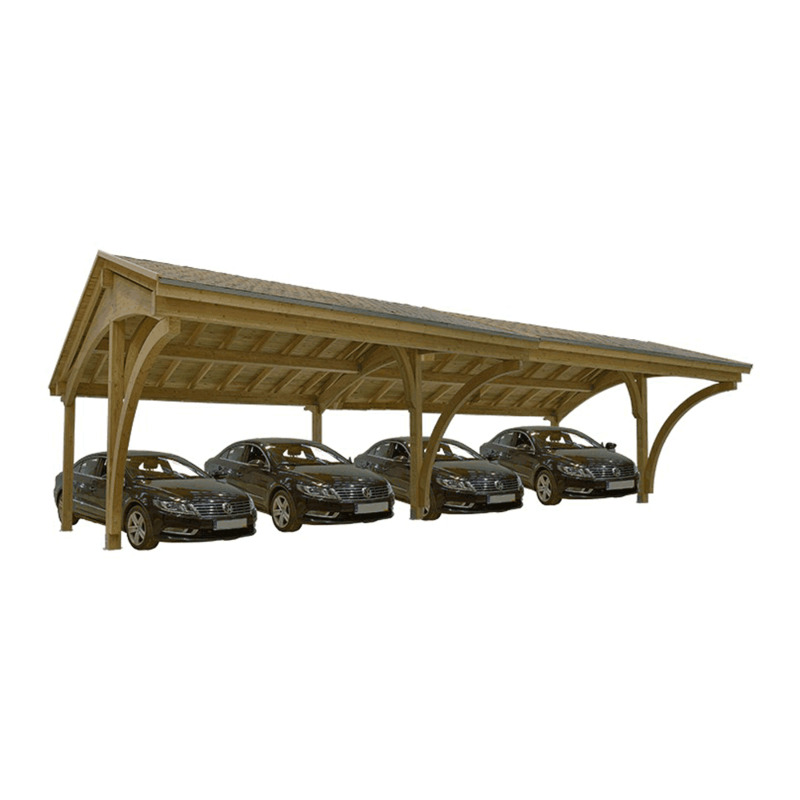 This very strong and resilient carport will protect two or three cars from hazards such as inclement weather or tree sap, or create a sheltered workspace for your outdoor area. Wooden elements can be stained or painted to fit in with the surrounding area, and this coupled with the choice of felt tiles means that this carport will be customizable to your needs. This versatile, durable, and expertly crafted wooden car port is sure to be a valuable addition to any outdoor space, and to serve a range of functions for years to come. Please note: The Revelatio IV wooden carport is delivered to you with all required fixings and assembly instructions however there are VERY heavy sections to this Carport which will require mechanical aids to assemble. Owing to the size, weight and exposure to winds and other weather conditions along with varying substrate conditions it is EXTREMELY important that this building is assembled correctly and anchored properly. Assembly should only be undertaken by very competent teams or by Jagrams own team. For information on an assembly service please contact us.